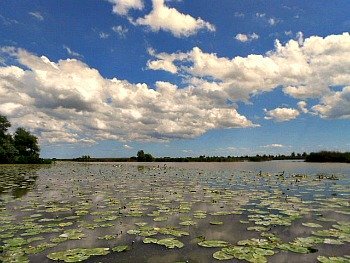 Campotto: Beautiful Wetland - and Paradise for Waterfowl - in the Po Delta. The Nature Oasis (or Reserve) of val Campotto is one of the vastest wetlands in Northern Italy, also recognized of international relevance following the Ramsar convention (1976). It is one of the stations of the Po Delta Regional Park and it includes the expansion basins (so-called 'casse di espansione' in Italian) of Campotto/Bassarone and Vallesanta, as well as the hygrophilous woodland known as the 'Traversante’, extended over about 1,600 hectares. These large water expanses – however 'natural' they may look at first sight – are in fact man-made, and they perform an important hydraulic function, as they act as expansion basins holding the water of two of the river Reno's main tributaries (the Idice and Sillaro) when they are in flood. It is also worth pointing out that the term 'valle' ('valley') can be quite misleading, as here it is used to refer to flat, inundated areas ranging from sea-linked lakes to deep still pools rich in aquatic activity. The frequent variations in the water levels – connected also with the management of the reclaimed areas – have a noticeable influence on the presence of animals and plants; the flora and fauna are therefore extraordinarily rich and varied. Especially, the intense alternation of different migrating birds during the course of a year constantly renovates the populations of typical species present in the area, with a wide range of Anatidae (the biological family of birds that includes ducks, geese and swans), several herons (such as Squacco heron), egrets (Great White Egret), and rarer presences like Whiskered Tern (Chlidonias hybridus) and Black-winged Stilt (Himantopus himantopus), among the others. Dedicated viewing platforms allow the observation of the different bird species in their natural habitat throughout the year. The whole region around the Po Delta – even for quite some distance inland – is undoubtedly dominated by water, and very rich in canals too (see image above). In the area around Campotto and Argenta there is an interesting Ecomuseum, which aims to show the continued struggle for man to achieve a precarious balance with water in these plains, as well as to convey the naturalistic values that the incredible region of the Po Delta – certainly subdued, very often understated – can offer. The Ecomuseum of Argenta is situated right at the centre of a triangle formed by the cities of Ferrara, Ravenna and Bologna, and can be quite easily reached from all three. It recounts the environment, the history and culture of this territory and its people, with a striking combination that comprises three different museums and a naturalistic section. On the whole, the Ecomuseum expresses the character of this land and of the communities which inhabit it, while looking after its extraordinary heritage. The 'Museo delle Valli' – annexed to the nearby Nature Reserve at Campotto – documents the evolution of the natural environment and the intervention of man in an area traditionally dominated by water, while providing information on natural history; it is also one of the Visitor Centres for the Emilia-Romagna side of the park. The 'Museo della Bonifica' is a unique example of industrial archaeology and is at the same time an active site; it tells the story of drainage projects in the area – as well as displaying pieces of machinery, sometimes still in use (the plant is in working order). A third museum is the Civic Museum: hosted in a former church in the centre of town, it is a good complement to the naturalistic collections as it displays a picture gallery and an archaeology section, both documenting the civic and artistic life of Argenta. More information on the two museums of naturalistic value is provided below; the Civic Museum is not described here in detail. 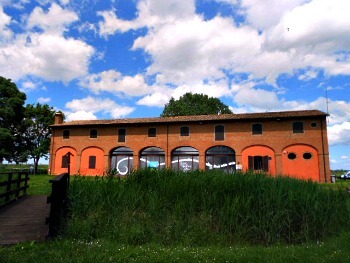 The 'Museo della Bonifica' ('Museum of the Reclaimed Lands') has its headquarters in the "Stabilimento Idrovoro" (water pumping station) at Saiarino: a monumental building that epitomises a common presence in these flat lands (there are many of these buildings, and visiting one of them would certainly help you to 'read' the landscape with different, more educated eyes; see an image of it above). The museum shows the general procedure of the reclamation process, as it was carried out traditionally; the artifacts, the pieces of machinery and their functioning are all well explained. 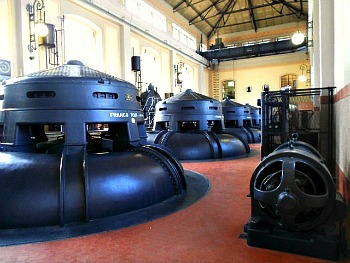 It is also a good example of industrial archaeology, where the machines and the historic plant are integrated with the human and technical resources of the 'Consorzio della Bonifica Renana' – the institution that historically has been in charge of reclamation in this delicate section of the Po Valley. The visit route is articulated both outdoors and indoors, as well as in the company buildings, and includes the emissary canal, the archaeological route (displaying dismissed pieces of machinery), the impressive, cathedral-like pumping room (pictured below) and the historic plant. The “Museo delle Valli d'Argenta” is situated at the entrance of the Campotto Nature Reserve and is in strict physical and cultural unity with it. It has as a main objective the description of the morphology of the territory and the local environment around Argenta. It deals with the life of plants and animals, as well as with the history of human intervention in this area throughout the centuries; in a nutshell, one could say that it aims at putting together the history and the natural setting of the area. The multimedia information available is primarily focused on education, and also thought with those visitors that are interested in expanding their naturalistic, environmental and historical knowledge in mind. The Headquarter of the Museum is in the so-called ‘Casino di Campotto’, which hosts the historic and naturalistic section, offers several educational services as well as displaying the main collections. Here the visitors can read about archaeology and topography, watch the video documentaries and browse the history exhibition. There is also a large model explaining the functioning of the reclamation process in the ‘Valli d'Argenta’ (see an image of the museum's exterior below). There are also two special displays here: the “Concerto della Valle” (‘A Concert in the Valley’) and the “Sosta nell'Oasi” (‘A Stop in the Oasis’), which present – respectively – the birdsongs and the sounds of the ‘valleys’, in dedicated rooms with audiovisuals and exhibits. 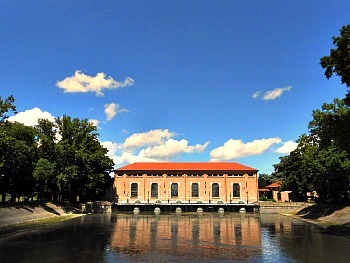 The adjacent ‘Valli di Campotto’ constitute the ‘live’ naturalistic section, while nearby “Museo della Bonifica” – by the water pumping station at Saiarino (described above) – hosts the hydraulic section. All in all, this goes to form one of the foremost museum compounds of this kind in Europe, with a thorough historic and naturalistic documentation on water management in flat lands. The 'Museo delle Valli' is in fact the gateway to both the Ecomuseum and the Po Delta Regional Park when coming from inland, as it performs the functions of administrative headquarters and visitors centre; in 1992 it was also awarded the title of “Museo dell’Anno” (‘Museum of the Year’) by the European Council. Today it has been completely renovated and it offers visitors a broad panorama related to culture, local traditions and the natural environment. Here, before entering the Campotto Nature Reserve, the visitor can listen to the counts of people who have worked in the ‘valleys’ as fishermen, boatmen, “vallarolo” (‘valley workers’) – collecting reeds and other plants growing in the marshland – ‘scariolante’ or ‘bonificatore’ (both tasks involved with the reclamation process) of the extensive wetlands that were to be turned into arable and habitable lands. The working tools, the boat, the “paraduro” (a type of watercraft) and the plastic of the reclamation all contribute to make the epic of the great enterprises of man in these lands dominated by water quite captivating. On the first floor, the naturalistic section offers a virtual visit route across the four different main natural habitats of the Campotto Nature Reserve: the cat-tail formation (Typha latifolia; 'lamineto' in Italian), the reed beds, the wet meadows and the hygrophilous woodland – all of them inhabited by a protected bird population which is of absolute international relevance, and that includes Eurasian Whiskered Tern (Chlidonias hybridus, which nests on the leaves of white water lilies), several types of herons, and the fascinating microcosm of the insects – such as for instance Hermit Beetle, the many colourful butterflies and the elegant damson- and dragonflies, which all dance while skirting the water edge. The room dedicated to the senses proposes a film rich in special effects in order to travel through the different seasons and the changes between day and night; this provides a fascinating virtual tour of the Nature Reserve and a good introduction to it, surprising and thrilling at the same time. At the end of the visit, the ‘great archive’ of nature finally suggests a tactile and cognitive experience with the help of boards, videos, reproductions, traces and signs of the local fauna, before visiting the actual Reserve. A first bird-watching viewing platform is situated a short distance off the road connecting Argenta and Campotto, on the margin of the Cassa Campotto and a short distance before the 'Museo delle Valli'. 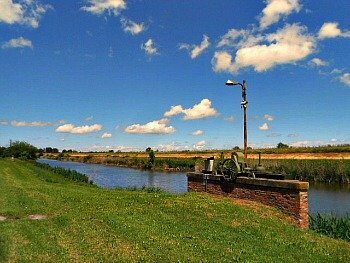 It is also possible to cycle on the embankment along the Cassa Bassarone and the Cassa di Campotto; it is a route about 6 km long which allows wide, sweeping views over the entire 'valleys', dotted with water lilies, reed beds and cat-tail formations. Alternatively, if you park in the area of Vallesanta during the weekends (and on Thursdays), it is possible to accomplish a roundtrip by bicycle, which also gives the chance to admire the characteristic wet meadows. On the same days, and starting from the same location (Vallesanta), one can also complete a smaller roundtrip on foot, which allows to circumnavigate the whole Cassa di Vallesanta, first crossing the woodland of the 'Bosco del Traversante’ and then enjoying extensive views over the wetlands on the return route (there is also a new bird-watching viewing platform). This latter location can in fact be reached on any day, if you walk along the perimeter of the Cassa di Vallesanta (basically, go straight past the parking lot; the 'valley' embankment starts just after crossing the canal).